The Salt Creek tiger beetle (Cicindela nevadica lincolniana). Photo credit: Mitch Paine. Steve Spomer is a Research Technologist with the University of Nebraska-Lincoln Department of Entomology. He’s been involved in Salt Creek Tiger Beetle research for more than two decades. Spomer is now working with the U.S. Fish and Wildlife Service in a capture and recovery program to save the species. PERRY: How has the Salt Creek Tiger Beetle habitat changed? SPOMER: Originally, the salt marsh around Lincoln was huge, probably 15 thousand acres or so. We assume that the beetle was a lot more common back around the turn-of-the century. The habitat originally was salt flats with seeps running through the flats. And now, most of the habitat is creek banks along Little Salt Creek. So a lot of things have changed in a hundred years. PERRY: Let’s talk about the recovery project that U.S. Fish & Wildlife Service spearheads. How will that help the species? Or do we even really know? SPOMER: Well, we don’t really know for sure. There’ve been a lot of recovery projects like this with insects and some of them have worked and some of them haven’t. But the problem is when the population is this low, it’s kind of a desperation move. You want to try to bolster that population up as much as you can and so this seemed to be a reasonable way to do it is by propagating them in the lab where they don’t have natural enemies to kill them. What we have to get worked out is how to successfully rear them from egg to adult without losing very many. There are a lot of variables involved. Temperature, humidity, soil moisture, how often you feed them. All kinds of things. PERRY: The numbers of beetles are so small if it doesn’t work this first time around, will we try it again? SPOMER: This is something we’ve been experimenting with for probably seven or eight years. We started out using an aquarium full of soil and had pretty good luck getting eggs and larvae, but then we found out that the burrows would sometimes intersect each other and the larvae would kill each other. So then we started rearing them in these plastic tubes individually, the method we’re using right now. Hopefully, this will be a long-term project. PERRY: Recently it came out in the news about an accidental dumping of fill dirt in some of the habitat. What kind of damage happened in that area? 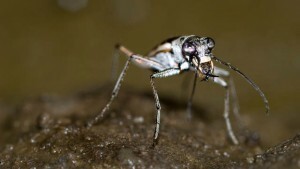 SPOMER: The Salt Creek tiger beetle has a two-year life cycle and that happened a year ago. So it would take a couple of years to see the results. If it covered up the larvae or the eggs to the point where they couldn’t burrow out, we don’t know. This year, I did find one adult there where that soil was dumped so potentially, there still might be a population there, I hadn’t seen any beetles there for almost ten years. So to find that pair of beetles there in 2010, I felt pretty outstanding. And then to see one there again this year was still hopeful that the population is going be okay. PERRY: Tell me a little bit about what you see is the value of the Salt Creek tiger beetle. And of course, the habitat that goes along with it. SPOMER: Well, I think you have to look at the bigger picture. You have to look at the salt marsh in general and what is there and how unique that habitat is to this part of the country, an inland salt marsh like that. You’ve got a lot of species there that aren’t found other places. There’s a rare damsel fly, the Desert Forktail (Ischnura barberi) that’s found only in the salt marshes around Lincoln here. You’ve got the endangered salt wort plant out here, called the red swampfire (Salicornia rubra). I think you kind of have to look at the whole ecosystem and not just focus on one insect or one plant. It would be a shame to lose a treasure like this, something that basically put Lincoln on the map. The salt industry was what attracted people to Lincoln and before that, the native people had been using the salt here for years before the white settlers came in so I think it’s important we keep it. PERRY: And how hopeful are you that the species will survive? SPOMER: I still have hope, but the last couple of years the population has been pretty low although this year, it was up a little bit. 2010 and 2009, we had some flooding that really damaged part of the population. And when you have a population in such a small area, you can have a catastrophic event like that and it could wipe everything out and that’s the goal of recovery too is to try to not just bolster the numbers, but bolster the number of populations. So an event like that wouldn’t destroy everything. Perry Stoner is a multi-media Producer/Reporter with NET News. With NET for 20 years, he was a Videographer/Editor for the first half of that time. He's produced numerous short form journalism stories and multiple documentaries, including The Ethanol Maze , Prairie Wind and Crane Song . Perry has Bachelor of Journalism and Master of Arts, Journalism degrees, both from the University of Nebraska-Lincoln. Perry is married and has two children. He enjoys spending time with his family and going to Bob's pond in his spare time.